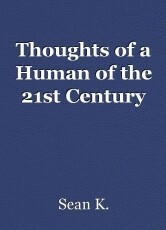 Thoughts of a Human of the 21st Century, short story by Sean K.
Short Story by: Sean K.
As a reader, there does come a time where one thinks about their (your) efforts in practically anything/everything. Depression is one main component of emotional experience one faces throughout life. Yet that has always been a more prominent emotion than anything else I have felt in the 21st Century. So why continue? What would you do if you were cornered, and you couldn’t get out of the situation you were in for all you know? Trapped not because you know, but because you don’t know? What if there was a way to get out, yet it would diminish what you, yourself, define as yourself who you are? Would you do it? Knowing that in the world we live in today, all that has been promised actually doesn’t exist, would you still push forward, knowing that in the future you would barely make any difference? No matter who we are in the developed world, there is no more progression. No more adventures, or any horizon to seek. We are all in purgatory for the sake of less than reason. We are nothing but people who hope, but can’t see what it will accomplish in our lifetime. We are nothing but those who ask, yet only use the moment to salvage our personal utopian worlds. We are nothing but a people who ask, take, and never give back, since it’s in our nature to keep one’s self sufficient with our subjectiveness. Is life worth living? Knowing that our leaders aren’t there for us? How does it feel knowing when you walk out the door, homeless, segregations of people, and people who hate for less than reason await you on your day? We haven’t reached a society worth loving, caring for, protecting, nor sharing. So why are we fighting still? Can’t we all finally make the difference, or can we all die already? It isn’t fair to wait when we know that our leaders aren’t truly there for us, the people. We are blinded by deviated social constructs for the sake of our stale progression, alas the people, my people, to actually believe in the nonsense they speak. If I can’t live in a world where we all can’t share just for the hell of it, and live as if the universe gapes it’s vastness towards humanity, then why the hell am I still here? This isn't a suicide note, this is an observation from a human. © Copyright 2019 Sean K.. All rights reserved. Other Content by Sean K.